The new logo, restaurant team uniforms and designs transforms Johnny Rockets to a modern day diner restaurant. Restaurant team members now wear dark denim jeans and white oxford shirts and denim striped waist aprons. The restaurant also added contemporary and industrial lighting, upholstered seating, counter and table chairs with warm grey tones, and wood detailing. Johnny Rockets in Orange also features a high efficiency kitchen using technology to prepare meals and serve guest quicker without sacrificing the quality of Johnny Rocket’s menu. 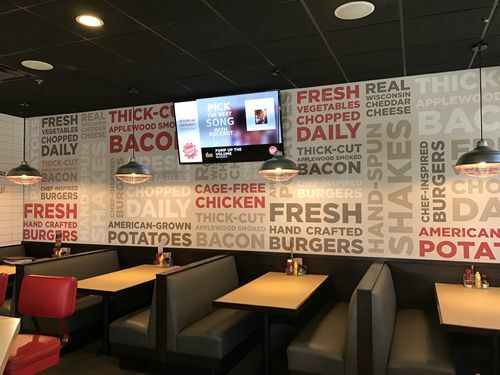 Johnny Rockets continues to open newly designed restaurants with drive thrus, kiosks in malls and airports, amusement parks, ball parks, and entertainment complexes worldwide.